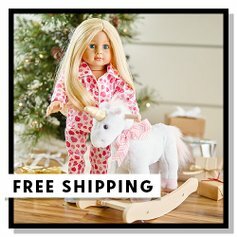 Make sure you check out this 18-Inch Doll Collection Up to 45% off AND Up to 75% off Dollie & Me Toddler to Girls! Your little one just wants to play with their doll, so let them. These styles are perfect for everyone's pint-size BFF. Scroll down to discover adorable outfits, furniture and beyond. Note: Only items in this event ship free. Standard shipping fees apply to items you may order from other events.